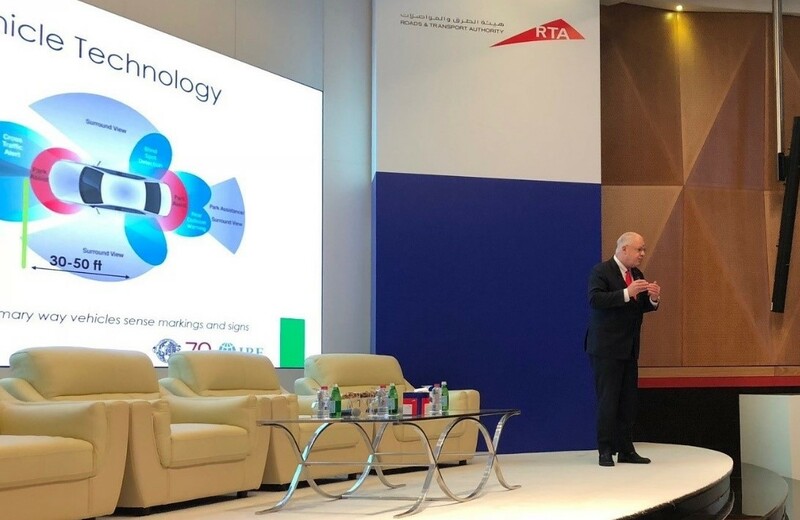 Mobility services are expected to undergo spectacular changes within next two decades with the introduction and widespread use of connected and autonomous vehicle (CAV) technology. However, the transition phase from human driving to self-driving will be gradual, requiring incremental interventions on the physical and digital road network to allow it to cope with mixed vehicular traffic. Cities such as Dubai have embraced the challenge by setting a target to reach 25% driverless trips by 2030 as part of an Autonomous Transportation Strategy adopted in 2016. IRF is currently assisting Dubai authorities in the fulfilment of this goal through a 3-year knowledge partnership program articulated around consensus-building workshops, training programs and limited scale pilot projects. New reports also point to the challenges presented by “unconstrained autonomous mobility” scenarios, where regulators do little to incorporate emerging mobility services in terms of infrastructure upgrades or policies. Under this scenario, the market share of point-to-point trips may actually increase congestion leading to travel times as much as 15 percent higher compared with the baseline scenario. Absent demand management and supply side strategies, such as repurposing current HOV lanes for autonomous vehicles, an absolute increase in vehicle miles travelled would exacerbate both urban and interurban congestion issues. “How CAVs will read traffic signal and signs precisely remains a fundamental problem to solve” Dr. Sowell. confirms. The United States Federal Highways Administration FHWA recently completed a Request for Information on integrating automated vehicle needs into the highway system. The number one requirement set by the automotive industry is for greater uniformity and quality in road markings and traffic control devices. “Having greater consistency and improved state of good repair benefits all categories of road users”. Recognizing this, several jurisdictions in the United States and Europe are already proposing new performance standards for machine-readable road markings in consultation with automotive and technology suppliers. Against this backdrop, leading ITS organizations and technology providers will join IRF in Las Vegas, on November 19-22 for panel discussions addressing the challenges and benefits of international cooperation in getting connected mobility solutions and roadway analytics at the top of the political agenda.